With a region as large and as varied as the Russian River Valley, it is important to know exactly where the fruit was grown in order to know what’s in the bottle. For fans of Russian River Valley Pinot Noir, three recent vintages (’07, ’08 and ’09) have been treasure troves. Although each vintage presented challenges, vintners finessed them. Collectively, these years add up to the greatest series of harvests in California Pinot’s history. There are several reasons for this: Vines planted in the early 2000s started to mature, vintners fine-tuned their techniques and Sideways helped—as demand for Pinot Noir rose, so did prices, giving winemakers the means to invest. Another important factor was that all three years were relatively cool. The result has been Pinot Noirs of unprecedented purity and transparency. That’s great news for wine lovers, and the icing on the cake is that these balanced wines allow the Russian River Valley’s multiple terroirs to shine through—terroirs, plural, being the operative term. The valley is so vast and diverse that the wines exhibit subtle differences. For Pinotphiles with discerning palates, knowing these differences can help them zero in on the wines that are most likely to offer deep enjoyment. 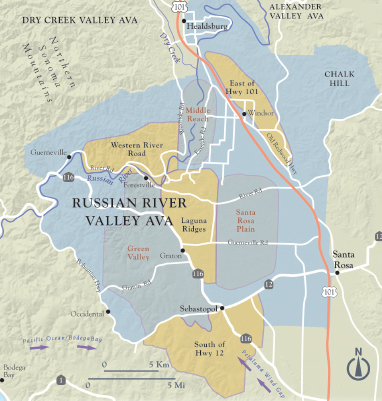 The Russian River Valley is a huge appellation, sprawling over 126,000 acres. As anyone who’s ever explored it on a summer day knows, one minute you can have the headlights on in a misty redwood grove, and the next, you’re reaching for the sunglasses and air conditioning as the sun beats down. The average July high temperature in Occidental, at the far southwestern edge of the appellation, is 11 degrees lower than in Healdsburg, 20 miles northeast. Grapes understand these radical temperature ranges, and so do winemakers. “I am now using the criteria of weather as a far more influential factor [than soil] in separating the general areas of distinction in the Russian River Valley,” says veteran winemaker Bob Cabral of Williams Selyem, who crafts at least nine valley Pinots in any given vintage. Yet, the fog isn’t a factor everywhere. Its impact, or lack thereof, depends on how far away the vineyard is from water—not just the Russian River itself, but the Pacific Ocean to the west and San Pablo Bay to the south. And topography plays a role. The valley is studded with peaks rising to nearly 2,000 feet. This creates conduits through which cold maritime air, including fog, can penetrate miles inland. Elevation plays a significant role, too. The highest ridge tops are often above the fog, allowing slow-ripening varieties like Zinfandel to thrive, where thin-skinned Pinot Noir grapes would overripen. There’s broad agreement that the Russian River Valley can be divided into three areas, based on a temperature–fog spectrum: the Middle Reach, the Santa Rosa Plain and Green Valley. This is essentially a warm-cool-cooler template. The Middle Reach, being inland, is the warmest part of the valley; there are even scattered plantings of Cabernet Sauvignon, and Dry Creek Valley is just a stone’s throw away. Middle Reach Pinot Noirs are rich, full-bodied,ripe and soft. At their best, as in Williams Selyem’s Estate bottling, they are the Russian River’s most opulent Pinot Noirs, feminine and dazzling in voluptuous charm. They are wines to drink young, although the best age well. If there’s a downside, it’s that the Middle Reach, especially as it approaches Healdsburg, flirts with overripeness, a tendency that can be aggravated in a hot year, or even by a single heat spike. The Santa Rosa Plain, by contrast, is a low-lying area east of the city of Santa Rosa, stretching west to where a series of hills, the Laguna Ridges, announce the Coast Ranges. Frost-prone in spring, it’s influenced by cool winds that sweep up from the Petaluma Gap to the south. A quintessential Santa Rosa Plain Pinot Noir is Joseph Swan’s Trenton Estate. It’s tangier, earthier and more mushroomy than almost anything from the Middle Reach, with harderedged tannins and firmer acidity. These are dry, elegant wines; they can be tight, even austere, in youth. But they brim with berries, and are wines to lay down. The Green Valley (which has been an AVA within Russian River Valley since 1983) is the area’s icebox, at least at the lower elevations where most of the Pinot grows. Green Valley gets a direct hit from the prevailing winds that sweep in off the Pacific and Bodega Bay, where the waters seldom rise to 60°F. Green Valley Pinots are intense, focused and exotically spiced, often with the feral, piney quality you get in cool-climate red wines. They are muscular wines, masculine to the Middle Reach’s femininity—full-bodied and forceful. Yet they can be delicate and nuanced—Pinot’s eternal paradox. Perhaps the classic Green Valley Pinot Noir is Dutton Goldfield’s Emerald Ridge bottling. Meanwhile, the key for consumers is that knowing precisely where a Russian River Valley Pinot Noir comes from can help determine what the wine is like. That, in turn, can assist in figuring out what foods to pair it with, or whether to age it. Of course, individual winemaker styles can mitigate terroir. But terroir always triumphs. If you want to maximize your enjoyment of a fine Russian River Pinot Noir, find out where the grapes come from. It’s worth the effort. Terroir lies at the heart of every great winegrowing region, and it’s thrilling that we’re beginning to understand the Russian River Valley as never before. For Pinot Noir aficionados, that will keep us pleasantly occupied for many years. The Russian River Valley’s broad array of terroirs means that it can produce good wines across a range of varieties, not just Pinot Noir. Here are 12 wines that have qualified for Wine Enthusiast’s Editor’s Choice designation—meaning, they offer excellent quality for the price and/or offer unique qualities that merit special attention. 98 Williams Selyem 2008 Litton Estate Pinot Noir (Russian River Valley); $100. This is the best of the winery’s new releases, both for drinking now and for cellaring. Combines power and elegance, with upscale flavors of cherry, currant, cola, rhubarb, dried herbs and oak, wrapped into devastatingly rich tannins and a perfect touch of acidity. Should age well for 10 years. Cellar Selection. 93 J Vineyards & Winery 2008 Nicole’s Vineyard Pinot Noir (Russian River Valley); $50. Here’s a luscious, delicious Pinot Noir for drinking now. It’s made in the modern style of soft ripeness, and features upfront cherry, cranberry, sweet fig and sandalwood flavors, with a tangy dusting of Indian spices. The acidity and tannins are near perfect. Drink now–2016. 88 Tudal 2009 Bacigalupi Vineyard Pinot Noir (Russian River Valley); $50. 97 Joseph Swan 2007 Trenton Estate Vineyard Pinot Noir (Russian River Valley); $52. An awesome Pinot Noir—it’s hard to find words to describe its beauty. It’s bone dry and rich in stimulating acidity, and the cherry and raspberry fruit flavors have an earthy, mushroomy quality that grounds the wine and gives it a real sense of terroir. Shows the fleshy attractions of the amazing ’07 vintage, with an undisputed capacity to age. Now–2017, at least. Editors’ Choice. 94 Fog Crest 2008 Estate Pinot Noir (Russian River Valley); $45. A marvelous Pinot Noir to drink now and over the next 6–7 years. It feels so rich and elaborate, with waves of raspberries, cherries, cola and oak, yet is tightly controlled by firm tannins and a great burst of citrusy acidity. Grows better and better as it warms in the glass. 96 Merry Edwards 2008 Klopp Ranch Méthode à L’Ancienne Pinot Noir (Russian River Valley); $57. So delicious and complex now in wild cherry, raspberry, Dr. Pepper cola, bacon and smoky sandalwood flavors, brightened with crisp acidity and totally dry despite the fruitiness. But you’ll also find a firm tannic structure that gives it some astringency. Drinkable now for sheer beauty but easily capable of aging for a decade. 96 Freeman 2008 Keefer Ranch Pinot Noir (Russian River Valley); $47. So pale in color, it’s hard to believe it packs so much flavor. Stuns with the complexity of its cherries, raspberries and cola, with fantastically spicy notes. Hard to describe just how intricate it feels, changing by the second as the palate uncovers additional nuances. A great Pinot Noir, defining silkiness and delicacy, and should age effortlessly for at least the next six years. 95 Marimar Estate 2007 Don Miguel Vineyard Cristina Pinot Noir (Russian River Valley); $49. Massive, flamboyantly rich, a real treasure in the mouth. Just dazzles with the intensity of cherries, black raspberries, Dr. Pepper cola, plums, sweet vanilla- scented sandalwood and a wild array of savory spices. The wine is a small-production barrel selection from the estate vineyard, which is in the heart of the Green Valley. Drink now and through 2013, at least. 94 Dutton Goldfield 2009 Dutton Ranch Emerald Ranch Pinot Noir (Green Valley); $58. An extraordinarily beautiful Pinot Noir, dry, silky and just captivating. With profoundly ripe cherry and mulberry fruit, it shows earthy complexities, spices and flowers, and the oak overlay is just about perfect. A gorgeous wine that should age for six years.